Christopher (7) Temple Emmet, called Temple, was born in Dublin and named after Thomas (1) Addis Emmet's (TAE's) adored older brother. His father was in Kilmainham Gaol while Temple was an infant, and his mother Jane (Patten) Emmet would visit her husband there, leaving only to go home to nurse her baby. Like his two older brothers, he was largely raised by his grandparents, and his aunt Mary Ann while his parents were in prison in Scotland, and Temple was not reunited with them until his arrival in New York City in 1805. He probably went to the same school in Flushing that his brothers John and Tom attended, only to leave New York to join the US Navy as a young boy. It was then the custom for the Navy to place young midshipmen with one commander when they started their careers, and to leave them with this officer, moving from ship to ship with that commander until promoted to higher ranks. Temple was placed with Capt. Stephen Decatur for many years, and, at the age of 14, was on the frigate United States in October of 1812 when Decatur captured the British ship, the Macedonian, after a lengthy battle. The War of 1812 had been underway for only a few months, and the news of this victory led to an outburst of patriotism in America. In a letter to TAE in April of 1818, Decatur wrote that he was not able to get a promotion for Temple as he was still too young, but he would continue to work on it. "We have fought together on the losing as well as the winning sides. I have seen him in each situation act gallantly. Under these circumstances were I to forget the claims upon me of a companion in arms, I would be ungrateful and cold blooded, neither of which I hope will ever be fairly attributed to my character." 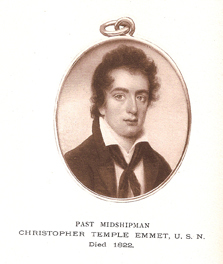 In the winter of 1819, Temple was transferred to the USS Columbus under Commodore Bainbridge, as Decatur had been promoted to Commodore and moved to Washington, DC. Joined by a fellow New Yorker, Herman Rutgers, the boys sailed around the Mediterranean, returning to Boston 18 months later when the two friends received furloughs. Temple was careful to come home with exotic costumes and jewelery from the many countries he had visited, knowing the fun his brothers and sisters would have dressing up for their many parties. His elder brother Robert (2) wrote his sister Elizabeth (4) describing the visit, saying that "(Temple) spits tobacco most lustily." On March 15, 1822, Temple and his friend Herman Rutgers both received orders to join the Macedonian - the same ship Decatur had captured, now repaired and part of the US Navy. She had been used to fight the Barbary pirates off the coast of Algeria and then to patrol the coasts of South America protecting US commercial shipping interests. Once Herman and Temple joined the crew, the Macedonian went to the Caribbean, still guarding US ships, under a Capt James Biddle, who like Temple, joined the Navy as a midshipman while a young boy; he moved up through the ranks, becoming a Captain as a result of his bravery in the War of 1812. Biddle also served as a diplomatic agent for the US government in Cuba, as he wrote the Governor General on April 30, 1822: "I have the honor to represent that the commercial relations btween the US and Cuba are already very considerable and that they would unquestionably be more considerable if rendered more secure from unlawful depradations." Biddle goes on to ask permission to send armed men on to the shores of Cuba in pursuit of the perpetrators of the unlawful depradations. Permission was denied. Frustrated by the Governor General's refusal to cooperate, Biddle wrote the Secretary of the Navy that he planned to visit other Caribbean islands to reassure commercial ships that the Macedonian would protect them. A group of young American women came aboard for a visit on May 23rd when the ship had been in the harbor for a month. The youngest visitor from the island, aged 16, was escorted by a Lt Clements. Both he and the girl died within a few days. A week later another Marine died. On the morning of his death, his face and eyes were yellow and he spat up dark blood and the telltale black sputum. The ship's surgeon finally recognized the disease as yellow fever. The ship's departure was postponed and the "most eminent physician in Havana" was called in. Biddle took steps to protect his men from sickness by having the decks scrubbed daily; awnings were provided to protect the crew from the sun and the waters of the harbour - both considered impure. The hold became so warm that no one could go below. It was not then known that mosquitoes spread the disease. An alarmed Capt. Biddle ordered the ship to leave Havana at once, and follow his plan to sail from port to port in the Caribbean, but many of the places visited were as fever-ridden as Cuba. Despite trying to fumigate the hold with sulpher fires, there were 30 more dead sailors by the time the Macedonia returned to Havana in early July. The ship's surgeon fell ill on July 15th and died five days later. Biddle then received an urgent letter from the Secretary of State, John Quincy Adams, instructing him to go ashore at once to meet with plantation owners who wanted to overthrow the Spanish rulers. These secret negotiations kept the ship in port another week, and nineteen more men died on July 23rd, including Temple Emmet, aged 23. When the ship finally sailed on July 24th, Herman Rutgers and eight-three others were on the sick list. With no doctor on board, and those on the sick list crawling up to the top deck waiting for a release from their fevers, intense headaches and continuous vomiting, Biddle decided to sail for home at once. Herman died a few days later on the way back. Both young men were buried at sea.